Linoleum is manufactured by combining wood flour or cork dust with linseed oil. Unlike layered flooring products, the color and quality of linoleum remains uniform, even after excessive wear removes the initial finish. For this reason, most linoleum that is in good condition can easily be refinished. The method used to refinish linoleum flooring will be familiar to anyone who has refinished a wood floor. However, homeowners who have never used urethane varnish to refinish flooring may be surprised at the length of time it takes to complete this home improvement project. Remove any baseboards in the room using a pry bar. Number the back of each piece with a pencil to insure that they can easily be reinstalled once the project is complete. Remove any doors that obstruct the floor by removing them from the hinges using a screwdriver. Strip the wax from the linoleum floor using a wax removal solvent or cleaner. Alternatively, you can use a mixture of one part ammonia to two parts water and a scrub brush to remove any wax buildup on the floor. Look for any dents or deep scratches in the linoleum. Use a high quality wood putty matched to the color of the linoleum to fill any imperfections. Sand the linoleum using 120-grit sandpaper. Remove any small scratches and smooth any patched areas by sanding. Use a floor sander if you are refinishing a large area. 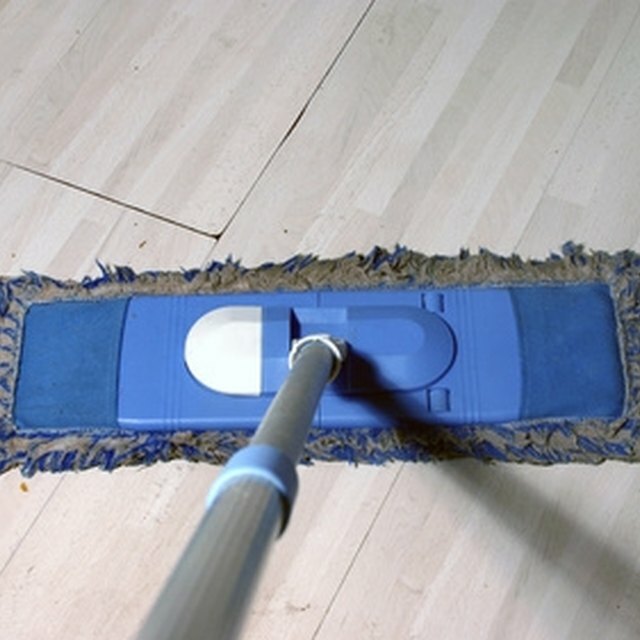 Sweep dust from the floor using a broom. Use a dry cloth to remove any remaining dust particles before continuing. Open all windows in the room to ensure that the area is well ventilated. Apply a coat of high-gloss urethane varnish using a lamb's wool mop or wide paintbrush. Take care to avoid brush marks if a paintbrush is used. Allow the linoleum to dry for at least 12 hours before proceeding. Sand the entire floor lightly using a pole sander fitted with 120-grit sandpaper after the first coat of urethane has dried. Remove any bubbles or imperfections in the finish using sandpaper. Clean the floor with a dry cloth. Apply a second coat of high-gloss urethane varnish using the lamb's wool mop or a paintbrush. Allow the linoleum to dry for at least 24 hours before continuing. Replace the baseboards using finishing nails and a small hammer. Reattach any doors that were removed with a screwdriver. When sanding the flooring in between coats of urethane, look for gummy residue on the sandpaper. If such residue is present, stop sanding and allow the flooring to dry for at least another 4 hours. Keep in mind that time required for each coat of urethane to dry will vary depending on the humidity and temperature of the room. Pay attention to the manufacturer's estimated drying times, but don't hesitate to extend these times to accommodate abnormal weather. High traffic areas, such as kitchens and entryways, may benefit from additional coats of urethane. Four coats is standard for these areas of the home. Although not required, a face mask that filters volatile organic compounds (VOCs) is always recommended when working with a urethane varnish.